If you or a member of your household has any special needs that may affect your ability to cope in a disaster, make arrangements now to ensure you get the help you need if there is an emergency. We recommend spending an hour so at Get Ready, Get Thru, the Government’s resource to help New Zealanders prepare for disasters and emergencies. There is special advice for those who have hearing or sight impairments, have a physical disability or mobility impairment, have asthma or respiratory problems, and people with special food requirements. Tools every family should download, print, and complete (and talk about) include a Household Emergency Plan and Household Emergency Checklist so everyone knows what to do if there is any kind of emergency. 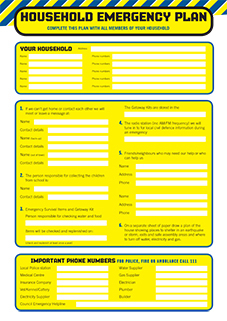 The site also has suggestions about how to make a so if you need to leave home in a hurry, you can grab the kit and go. There are also tips about what to keep in a Home First Aid Kit. Other advice at the Get Ready, Get Thru site covers pets and livestock, how to store water if supplies are disrupted, emergency sanitation, getting your car ready for an emergency, and radio stations to listen to if there is a disaster or emergency. You can access information about these topics in Simplified Chinese, Traditional Chinese, Hindi, Korean, Maori, Samoan, Tongan, and Arabic at the site. Listen here for the alert you will hear in your community if there is an emergency: recognise the sound so you know you will know there is an emergency if you hear it, and can act on your emergency plans!